Our Socorro trip during March 2019 exceeded all of our expectations. 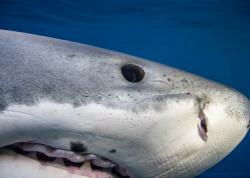 Sharks were out in large numbers, and came closer than we ever thought possible. Manta Rays were in abundance, larger than life and some allowed repeated close encounters. We also had some exciting, yet quick, dolphin encounters. We boarded the Rocio Del Mar liveaboard at 8AM, departed the dock at 10AM, and after 26 hours of a very smooth crossing we were getting ready for our first dive. 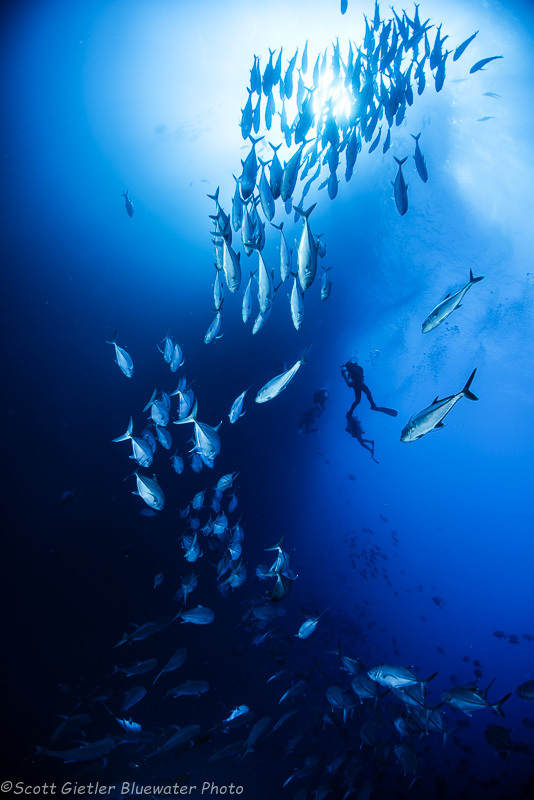 The Socorro Island and the Revillagigedos Archipelago can be found 250 miles south of Cabo San Lucas, Mexico - at the tip of the Baja peninsula. Sometimes referred to as the Mexican Galapagos, this remote archipelago is a magnet for a large assortment of oceanic giants - ranging from manta rays to whale sharks to humpback whales to hammerhead sharks to dolpins and more! 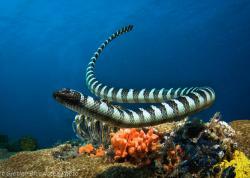 It's remoteness buffered the effects of human developement and maintained the wonder of ancient seas. You won't find tiny critters and colorful reefs here, but rather an assorment of large, inquisitive pelagic creatures of the deep. If you've always wanted to swim with whales, dolphins, rays, and sharks - this is your once in a lifetime chance! Make sure you bring your wide and fisheye lenses, you're going to need them. And there's no need to worry about visibility - on a good day at Roca Partida or the Boiler visibility can be up to 200 feet! The following photos are in chronological order from the trip. 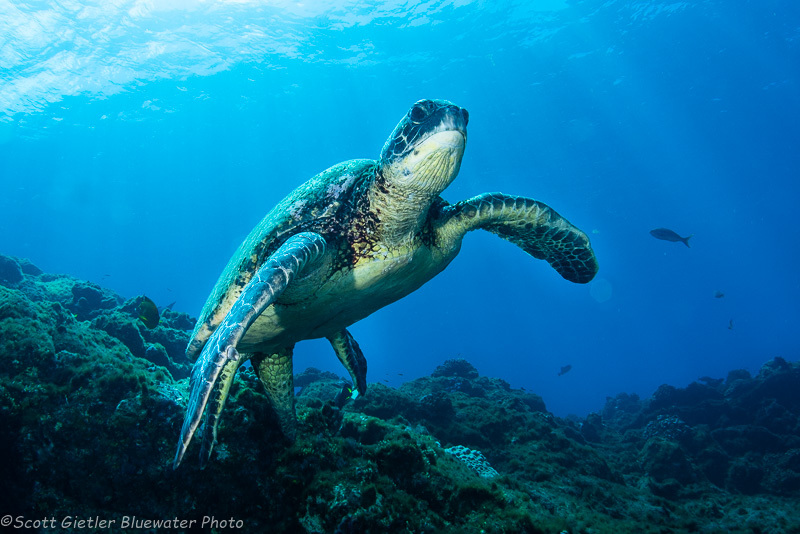 We saw mating turtles during the checkout dive - plus a Manta. A great start! 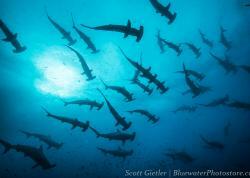 Schooling hammerheads on dive #2. This is when we knew we were in for a good trip! Silvertips were everywhere at San Benedicto. Half a second later, the dolphin got the fish. 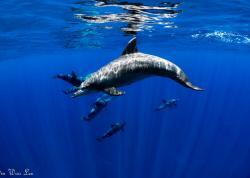 Almost the entire group got to enjoy this surprise early-morning dolphin hunting encounter. More Silvertips coming in close. 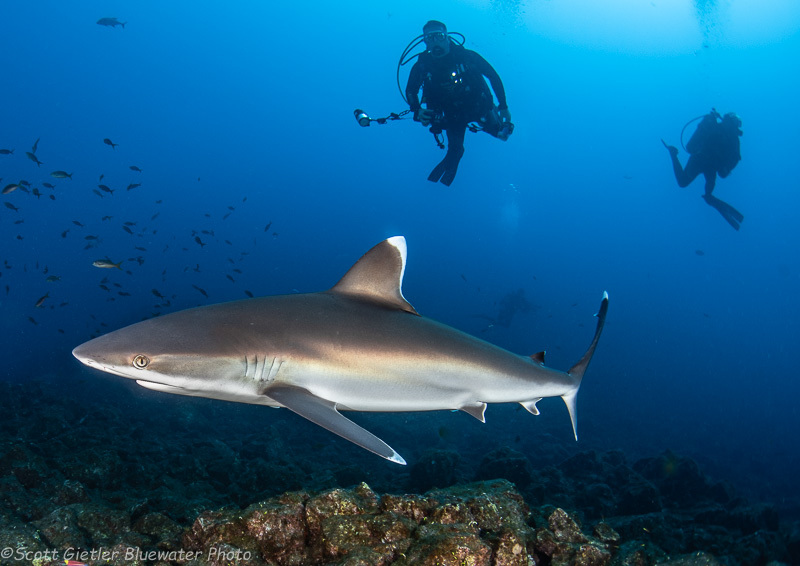 On several dives on San Benedicto, Silvertips and Galapagos sharks were everywhere. We also saw a Tiger Shark on this dive. Shark action was much better on this than in other years, some sites seemed to always have Galapagos or Silvertip sharks trying to get cleaned, often with a Tiger or Hammerhead off in the distance. 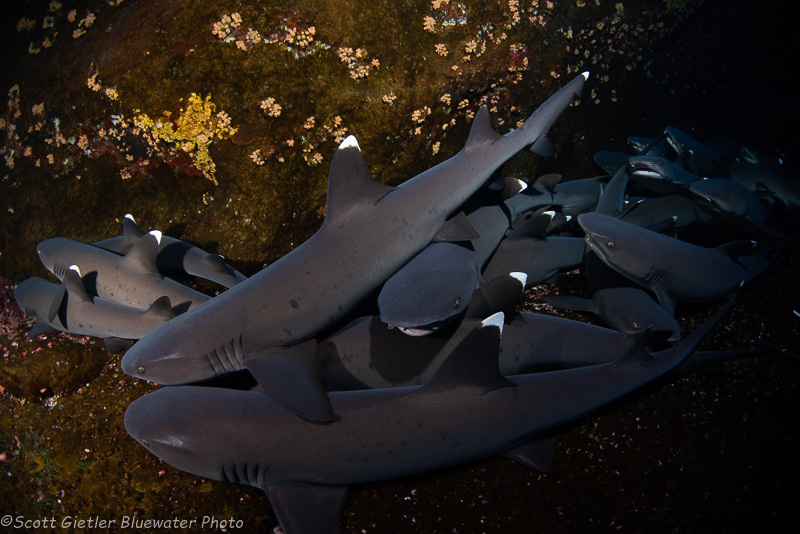 Whitetips like to pile on top of each other at Roca Partida. 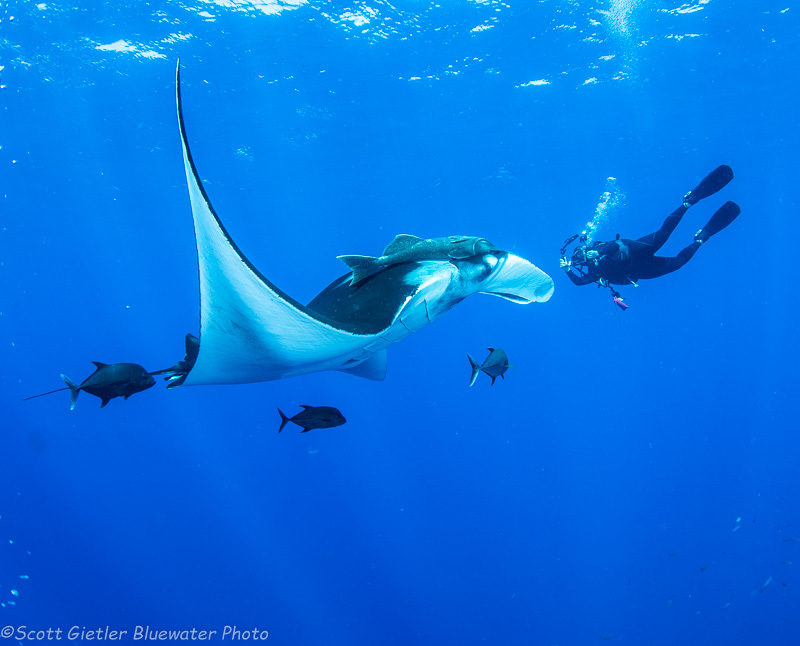 The manta ray interactions with the divers was incredible, and were the highlight of the trip. 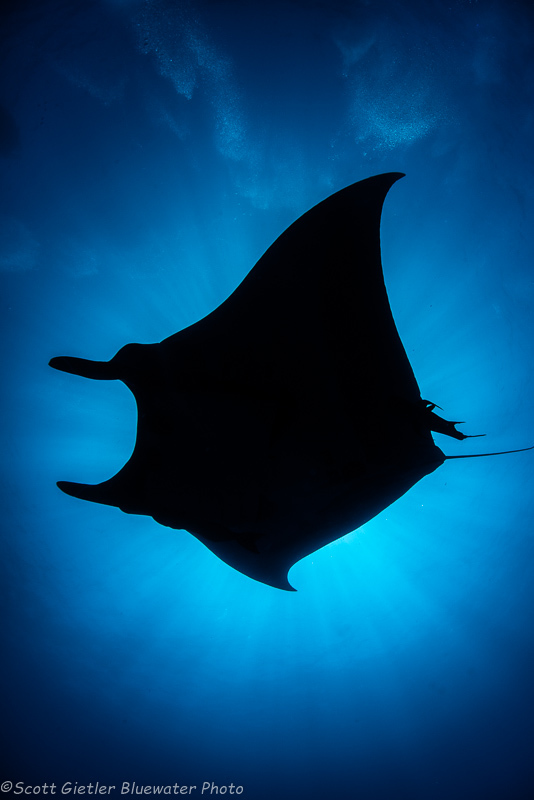 Manta Ray Silhouette - F14, ISO 200, 1/250th. After 20 dives in Socorro, we had a smooth 26-hour ride back to Cabo. The Rocio Del Mar was a well-run operation with a great chef, a very good dive operation and a well-trained crew. Being able to get my tank on easily, and getting on/off the panga easily is an important criteria for myself, and the Rocio scored an "A" in both of these categories. 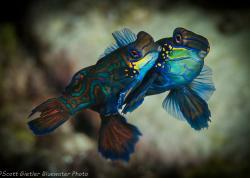 Cameras and domes were treated with care, and I felt like we were always brought to the best areas of the dive sites. Which Lens to Use Underwater? One common topic that came up during the trip was "which lens should I use?" It was usually between a fisheye and a rectilinear zoom like the micro-four thirds Panasonic 7-14mm, or the full-frame Nikon 16-35mm. But people also used mid-range lenses like the micro-four thirds Olympus 12-40mm. What I found out was that there was really no wrong lens to use. 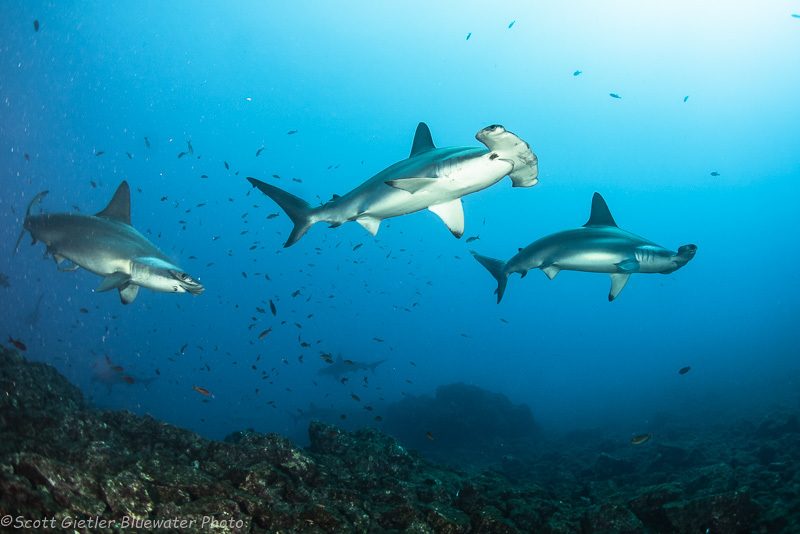 A wide-angle zoom worked well for sharks, but a fisheye lens could produce some epic close-up shots with a lot of detail. 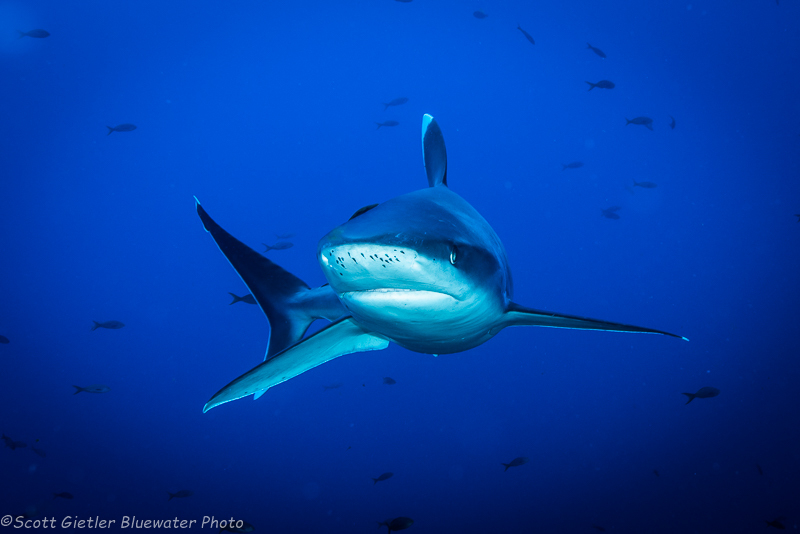 The mid-range lens produced some great tight shots and shark portraits. 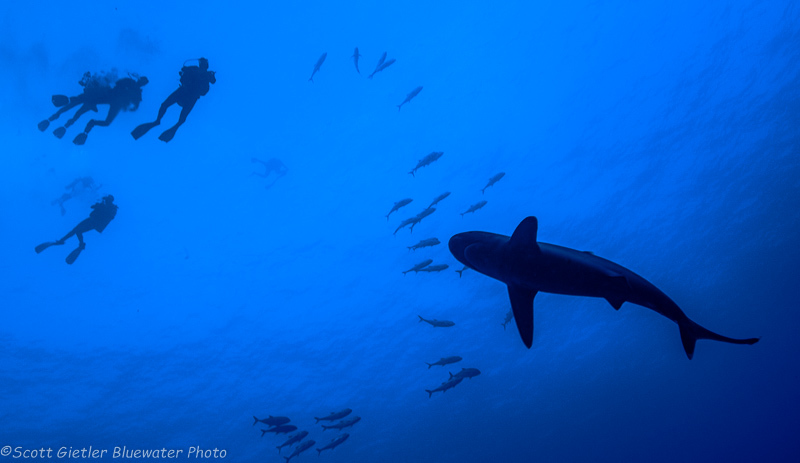 For Manta Rays and Schools of fish, I did often prefer the fisheye because I could get so close to those subjects. For underwater video, guests used gear ranging from the GoPro Hero 7, the Paralenz all the way to the Canon C200 Cinema camera. The C200 is a serious cinema camera capabily of great dynamic range, color depth and focus isolation. The GoPro Hero 7 performed exceptionally, with some guests commenting on how much better it was than previous GoPro versions. The Paralenz really surprised me with its ease of use, and the incredible amount of data that it produced such as depth and temperature during the videos, and the graphical displays of the dives. 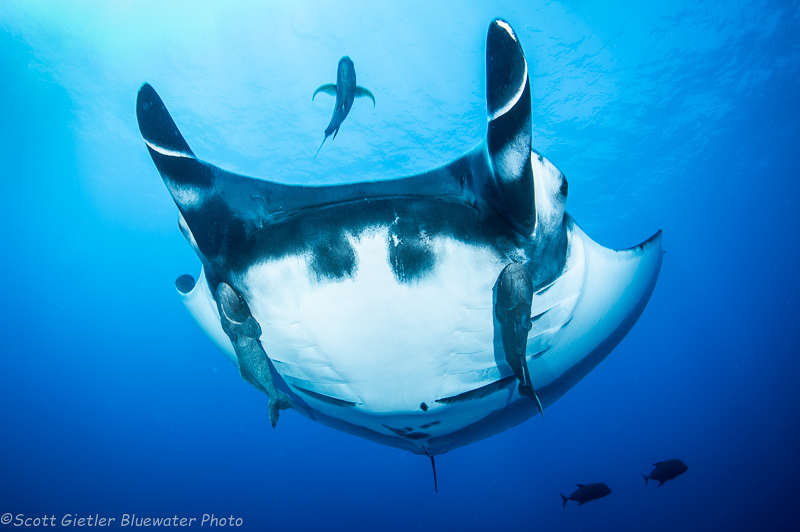 # of Manta Ray photos taken by Scott: 1,048! # of short fills: Zero! #1 – Ridiculously easy to get to from the USA. Simply take the short flight to San Jose del Cabo, Mexico. #2 – Friendliest giant Manta Rays in the world – need I say more? #5 – Photo / video opportunities lend themselves well to beginner and advanced shooters alike, with basic or advanced gear. 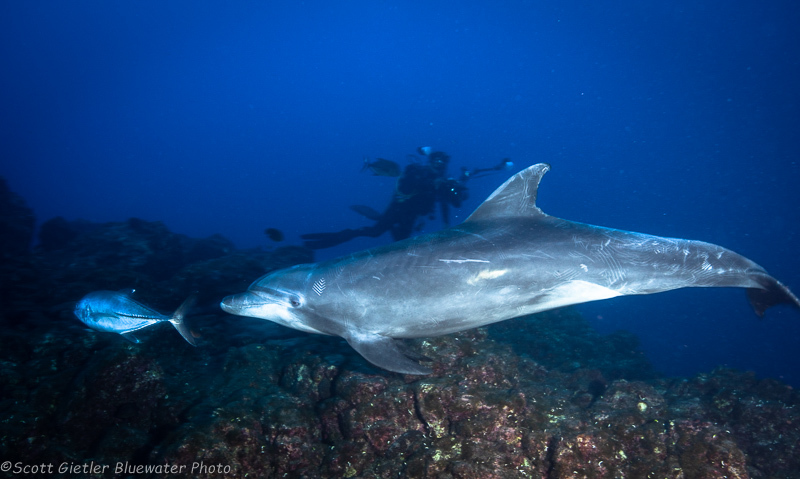 #6 – Sharks, dolphins, whale sharks, whales, baitballs, oversized yellowfin tuna, and the manta rays. Yes, all in one place. #10 – Mexican food is delicious! Join us on one of our photo workshops to Socorro! Join us on this 8-night Socorro trip on Nautilus Under Sea for giant mantas, sharks, dolphins and more! 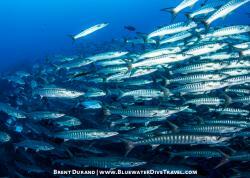 Fly into San José Del Cabo, Mexico for amazing liveaboard diving in the beautiful Socorro Islands. Trip led by Erik Lukas.